I'm putting this here so it gets more visitors to see it. This is from the thread on Tony Ortega's Underground Bunker in the Media Reports section. The article tells how Scientology set up the Internet to get the result it wanted when someone enters the words, "What is Scientology" in the Google search engine. I put it to the test. I put those words in the Google search engine. The first five items on the page were Scientology owned. But scroll down. The last item is for Operation Clambake, xenu.net. High marks to Scientology but not 100%. The more likely lazy search, which would be entering only 'scientology' in the search engine still gives Scientology the first two spots, but after that Clambake comes up very quickly. Clicking on 'images' shows Scientology has been working on outcreating™ the enturbulators. They're fairly successful, too, as it looks like they own the firs line of images and most of the second line. But scroll down a bit. Checking back on all this in a couple of weeks may have different results. 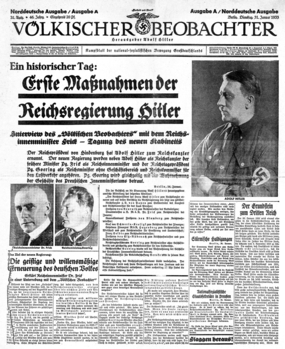 In the meantime can I interest you in a subscription to the Völkischer Beobachter? Don't you just love Godwin's Law? It comes up so often when discussing Scientology.